"I was sceptical to start off with, but that was soon replaced by curiosity." adding just the expected materials. 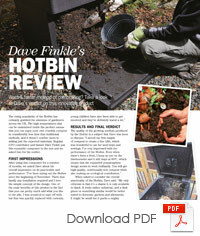 Regular Grow Your Own magazine contributor and farmer Dave Finkle put this reputable composter to the test and we asked him for his verdict. After using this composter for a number of months, we asked Dave about his overall impression on its practicality and performance: “I’ve been trying out the Hotbin since the beginning of November. There was hardly any installation required and I love the simple concept of the design. One of the main benefits of this product is the fact that you can pretty much add what you like to the pile.